OK, I know July is almost over but we only just heard that it is Watercolour Month so check out this photoart Mum created. Enjoy your weekend, and we hope it's cooled down a bit for you all! Athena! You are gorgeous! LOVE your art! It is wonderful! Your art is lovely, Athena, and so are you. My art is at the end of my Friday Flashback post. Athena, you are lovely as always. We love your eyes they are so soulful in this picture. Lovely art! We used a watercolor effect on ours too! You look beautiful in watercolor, Athena. We love what the effect does to your pretty eyes. I've noticed that most "watercolor" effects look nothing like true watercolors. I tried the effect on PS for this weeks art but scrapped the idea. Sweet pic, Athena. What a lovely pose and portrait of you Athena! 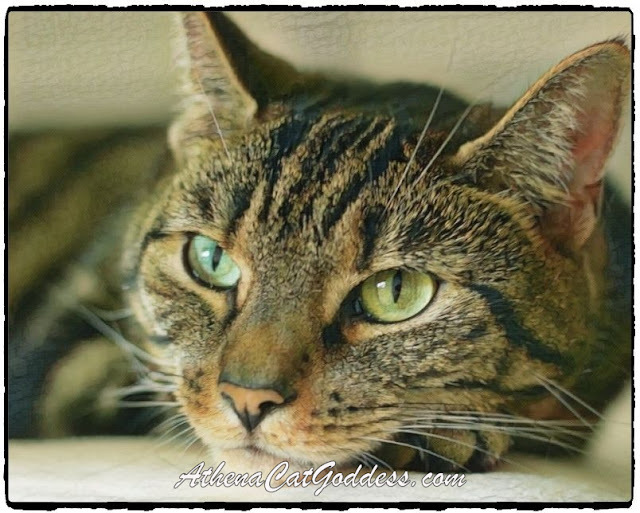 What a gorgeous photo of you Athena! Athena that is probably one of my most favorite pictures of you, ever! Love your art today, it's just purrrrrrrfect!